The new turret design – called "Shtampovannaya Bashnya" or the pressed turret – was based on the cast turrets from Factory No. 183, but here the UZTM used its 10,000 ton "Shleman" steel press (which had been used to make components for destroyers and other warships) to produce the new turrets from 45mm homogenous rolled armor plate. Under the direction of chief designer L. Ye. Gorlitskiy it was hoped the design would use 60mm plate, but the press could not handle this and thus 45mm plate was used. Surprisingly during testing it was found to be superior in protection to the then standard 52mm cast turret armor. UZTM produced both the cast turrets as well as the pressed steel turrets in parallel and sent out to other T-34 factories for production, but most commonly they were seen on Factory No. 112 (Krasnoye Sormovo) chassis. When production ceased on 1 March 1944 UZTM had produced between 2,050 and 2,062 of these turrets. They were used for both regular T-34 Model 1942 tanks as well as the Model 1943 with the commander's cupola. While Factory No. 183 built more than 5,700 tanks with the cupola there is no way to determine how many actually had the pressed steel UZTM turret; ditto the Krasnoye Sormovo tanks. The latter did produce its OT-34 tanks with this turret, however. This tank has always been a popular variant of the T-34 due to its unique turret shape, and now DML has updated its earlier Model 1942 pressed steel turret kit (No. 6487) with this modified turret and what appears to be a new production cupola, The name "Formochka" puzzles me, for it is not used by any contemporary Russian source nor any modern Russian historian, but only as a slang term (also used for "vacuform" as well) on Russian modelers' websites. DML continues to use it which is unfortunate. The kit adds several new sprues to the latest set of the molds and provides the cast wheels, cast wheels with rubber tires, new stern plate, new radiator exhaust grilles, and the turret and detail components. The shapes and angles match the Russian plans of the tank I have on hand. A new set of 500mm "waffle" tracks are provided in the form of a new set of "Magic Link" single link tracks. Each link does come with two ejection pin marks on the inner face, but these stand proud and while tedious are easily removed. As noted many older but well-done parts are used in this kit. The late-model double bump stops on the lower hull molding are still present, as previously noted they can't really be seen when the model is assembled and is a "so what" correction. The model comes with two standard PT periscopic sight/viewer with the "acorn" shaped cover found on most T-34s as well as the "cylinder" one seen on some tanks for the loader. A gun breech and partial interior to the turret are provided as with all of the DML T-34 kits. As noted the kit does not provide the late-model commander's cupola, but one could be adapted from a Tamiya T-34 Model 1943 kit. 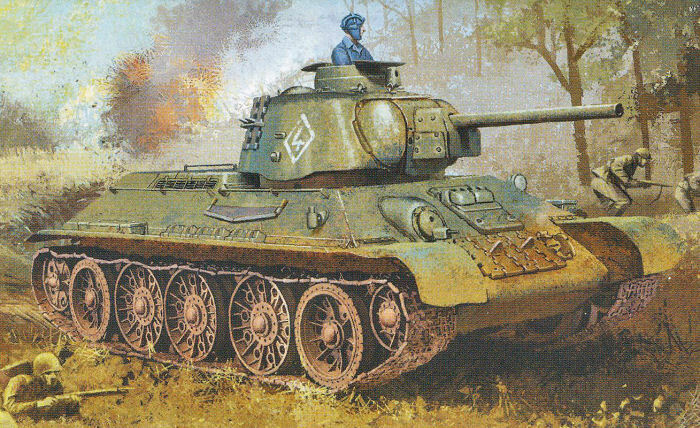 Note that these tanks could and did carry external fuel tanks, with one each going on the rear sides of the tank and two smaller ones on the stern plate; it is recommended you try to get copies of "T-34 Snizhu Doverkhu" by Sergey Kirsanov (Frontline Illustrated, a Russian magazine) if possible to see how these attach. Two different finishing directions are provided: Unidentified Unit, Eastern Front 1944 (4BO green, white diamond 4); 119th Independent Engineer Tank Regiment, 1st Baltic Front, Operation Bagration 1944 (4BO green, "David Sasunskiy", white diamond S, white 46). A targeted set of Cartograf decals are provided.